Louise O’Donnell presents “Coastlines, Country & Creatures” in association with AMH. The exhibition will be on show at Clotworthy House, Antrim from 9th – 13th October 2017. Louise ‘Fifties’ O’Donnell is an illustrator, graphic designer and DJ from the Ballymena area. Scribbling and drawing since she could hold a pencil, her love for all things creative was apparent from a very young age. After 20 years of honing her skills, she graduated with a BA Hons in illustration at Lincoln University (De Montford) (2000 – 2003). From here, she gained experience as a graphic designer working at a local newspaper and reading the photoshop manual in her spare time to expand her knowledge. Fast forward a year and Louise got her first studio job, at the same time gaining popularity as a freelancer DJ on the local club scene. Soon she supporting artists across the UK including Basement Jaxx, and Radio 1’s Andy George and Jaymo. In 2008, her circumstances changed and she decided to move back to Northern Ireland. These events took a toll on her mental health and she became unwell, finding herself in Holywell intensive care with symptoms of schizophrenia. With no access to computers or internet, she regained her love for painting and drawing, inspired by plants and flowers. It gave her a spark of hope where there wasn’t much at all. All the works in the exhibition, feature Louise’s return to her roots and her fondness for the medium of acrylics and pen. ‘Coastlines, Country and Creatures’ celebrates her love of wildlife and landscapes in Co.Antrim and beyond. Despite many setbacks over the years with both her mental and physical health, Louise’s music, art and design work is what has pulled her through times of trouble. She now volunteers at Holywell, and also attends AMH New Horizons Antrim where the peer support and excellent courses have helped aid her return to health. She is also a WRAP facilitator at the Recovery College. 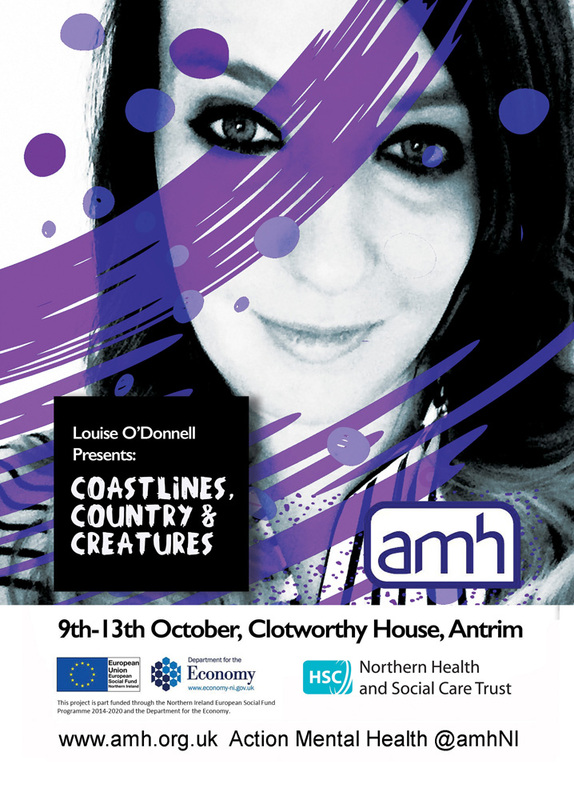 The Mayor of Antrim & Newtownabbey Council, Paul Hamill will officially open Louise O’Donnell’s art exhibition, Coastlines, Country and Creatures at 11.00am on Monday 9 October as part of our activities to mark WMHD. AMH New Horizons Antrim is part-funded by the NI ESF Programme 2014-2020 and the Department for the Economy.